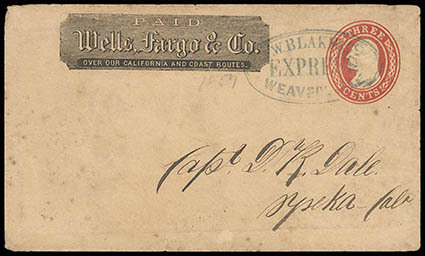 F. W. Blake & Cos., Express, Weaverville, blue double-line oval handstamp cancels 3¢ red (U10) Nesbitt buff entire with Wells, Fargo & Co. printed frank, to Yreka Cal., pencil "1857"; minor edge wear; accompanied by a newspaper ad from the Trinity Journal Jul. 25, 1857 that shows Blake was still operating his Shasta-Weaverville express connecting with Wells Fargo after 1855, Very Fine, ex-Haas. Thomas No. BAK-100 Estimate $750 - 1,000. Francis Wheeler Blake arrived in California in 1852 and in the fall of that year found employment at Rhodes & Lusk as their agent in Weaverville. By September of 1855, Rhodes & Lusk had become Rhodes & Co. About this time, Blake resigned and formed F.W. Blake & Co's Banking and Express. He initially ran from a base at Shasta City to Weaverville, but in October switched to a Weaverville base with a terminus at Shasta. While advertising that he connected with both Wells Fargo and Pacific Express at Shasta, he was closely aligned with Wells Fargo. 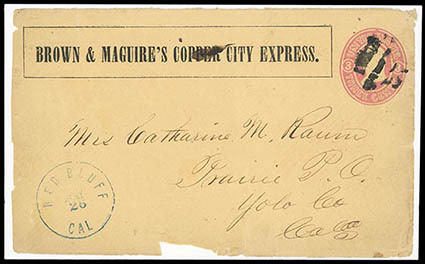 Brown & Maguire's Copper City Express., printed rectangular frank on 3¢ pink (U35) buff cover front with "Red Bluff, Cal, May 26" cds to Prairie P.O., Yolo Co., Cal. ; faulty, Fine, Census #WC7670, ex-Dale-Lichtenstein. Thomas No. BRO-001 Estimate $300 - 400. ONE OF ONLY TWO RECORDED EXAMPLES OF THE BROWN & MAQUIRE'S COPPER CITY EXPRESS FRANK. It is believed that this express operated between Red Bluff and Copper City Cal. along the Yreka Road. Cram Rogers & Co. Express. 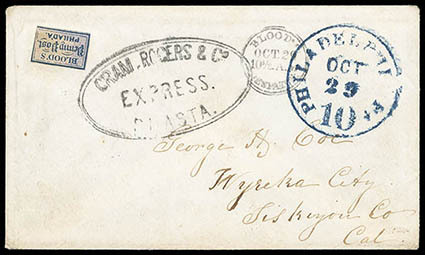 Shasta, clear strike of double-oval handstamp on cover from Philadelphia Pa. to Yreka City, Cal., clear strike of "Blood's Despatch, Oct 29, 10½ A.M." cds and acid tied Bloods, 1¢ blue & pink on bluish (15L15) at upper left, entered mails with blue "Philadelphia Pa. '10' Oct 29" integral due cds, Very Fine and choice; with 2017 P.F. certificate. A REMARKABLE TRIPLE-CONJUNCTIVE USE OF BLOOD'S PENNY POST, U.S. POST OFFICE AND CRAM, ROGERS & CO EXPRESS. Cram, Rogers was the major express operator in North California and Southern Oregon during the early 1850s. The express was formed from a conglomerate of a number of smaller express companies that had operated in this area. They covered an enormous territory stretching from Crescent City on the coast to Jacksonville, Oregon and down through Yreka to Shasta and surrounds. 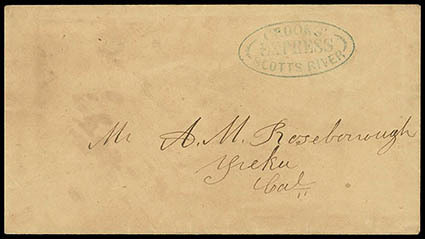 Crooks' Express, Scotts River, blue oval handstamp on buff cover to Yreka Cal., Very Fine and choice, ex-Dale-Lichtenstein. AN EXCEPTIONAL STRIKE OF THE CROOK'S EXPRESS SCOTTS RIVER OVAL. A.D. Crook ran an express service from Yreka to the mines along the Scott and Klamath Rivers. 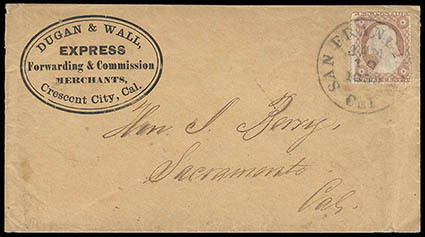 Dugan & Wall, Express, Forwarding & Commission Merchants, Crescent City, Cal., printed double-oval on buff cover bearing 3¢ dull red (26), small flaws, tied by "San Francisco Cal., Jan 19, 1859" cds to Sacramento Cal. ; some edge wear and flap tear, Very Fine, ex Dale-Lichtenstein. Thomas No. DUG-400 Estimate $500 - 750. THE ONLY RECORDED EXAMPLE OF THIS PRINTED DUGAN & WALL EXPRESS FRANK. Richard Dugan and Joe Wall operated from California's northern sea port at Crescent City serving Northern California and southern Oregon. At first they relied on Nichol's Express and Freeman Express to connect them by water to San Francisco. From Crescent City they connect overland with Johnson Express for service into southern Oregon. In December 1859, Wells Fargo replaced Nichols and Freeman as a connecting partner. They concentrated on serving Northern California and Southern Oregon as a package and parcel carrier. 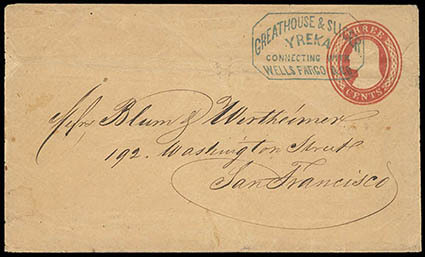 Greathouse & Slicer, Yreka, Connecting with Wells Fargo & Co., sharp strike of blue octagon handstamp cancels 3¢ red (U10) buff Nesbitt entire to San Francisco Cal. ; small edge flaw at left and torn flap, Very Fine and rare handstamp, ex-Dale-Lichtenstein. Thomas No. GRT-100 Estimate $750 - 1,000. George, Henry and Ridgley Greathouse started by operating a pack line express service between Shasta, California and Callahan's Rancho in Siskiyou County, Cal. They were soon into banking, and a stage service that supported an express and passenger service. With the addition of Hugh Slicer as a partner in late 1855, they expanded the state/express business throughout Northern California and into Oregon and Idaho. They became the Yreka agents for Wells, Fargo & Co. From the Shasta Courier of December 22, 1855: Greathouse and Slicer were "now prepared to run a Daily Express from our office in Yreka to all parts of California and Oregon, connecting at Shasta with Wells, Fargo & Co.". 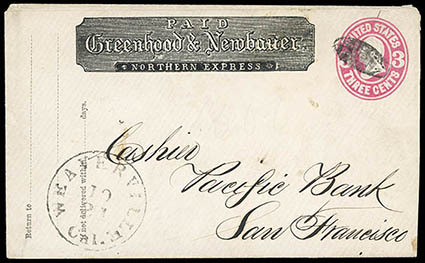 Greenhood & Newbauer Northern Express, printed paid frank on 3¢ pink (U58) entire cancelled by scarab cancel and matching "Weaverville Cal." cds to San Francisco Cal. ; reduced slightly at right, F.-V.F., ex-Pearce. Thomas No. GRH-001 Estimate $150 - 200. In late 1856, Herman Greenhood and Joseph Newbauer started an express operation from a base in Weaverville. They assumed Rhodes & Whitney's assets in early 1857. In the following year they purchased Rowe Express. The consolidation of the feeder expresses into Weaverville along with the establishment of a bank and a connection to Wells Fargo at Shasta, gave them control over the express business in Trinity County. This forced their competitor Blake's Express to close their Weaverville office in January 1859 and Wells Fargo switched all support. Further expansion gained penetration into the Trinity River area and as far northwest as Humboldt Bay area. In August 1867, the Greenhood & Newbauer banking business failed, taking the express operation with it, which business Grant I. Taggart's Stage operation quickly took over. 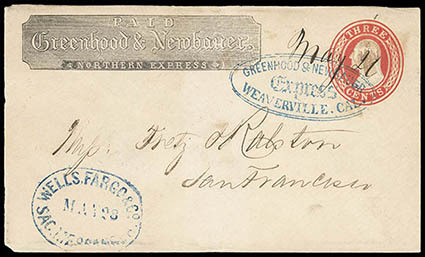 Greenwood & Newbauer Express, Weaverville, Cal., blue double-oval handstamp and manuscript "May 21" cancels 3¢ red (U9) Nesbitt entire to San Francisco Cal., printed "Greenhood & Newbauer frank (GRH-001), conjunctive strike of blue "Wells, Fargo & Co., Sac. Messenger, May 28" oval datestamp; some edge wear and reduced slightly at left, Very Fine and scarce conjunctive use, ex Dale-Lichtenstein. Thomas No. GRH-100 Estimate $300 - 400. 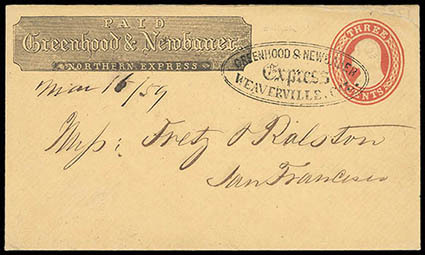 Greenwood & Newbauer Express, Weaverville, Cal., sharp strike of black double-oval on 3¢ red (U10) Nesbitt buff entire to San Francisco Cal., printed "Greenhood & Newbaner" error frank (GRH-002), manuscript "Mar 16/59" dating; upper right corner tear, otherwise Very Fine, ex-Bauer. Thomas No. GRH-100 Estimate $150 - 200. 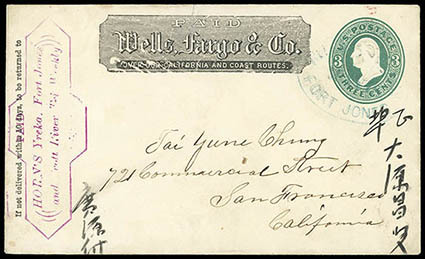 Horn's Yreka, Fort Jones and Scott River Tri-Weekly Express, violet cigar band shaped paid frank handstamp used in conjunction with printed Wells Fargo & Co. paid frank on 3¢ green (U164) entire cancelled by blue "Wells Fargo & Co's, Fort Jones" oval datestamp to San Francisco Cal., Chinese character endorsements; small top edge tear and small part of flap missing, Very Fine, ex-Clifford. Dave Horn began operating an express in the mid 1870s between Fort Jones and Yreka. This express serviced the mining area along the Scott River and connected with Wells Fargo at Yreka and Fort Jones.